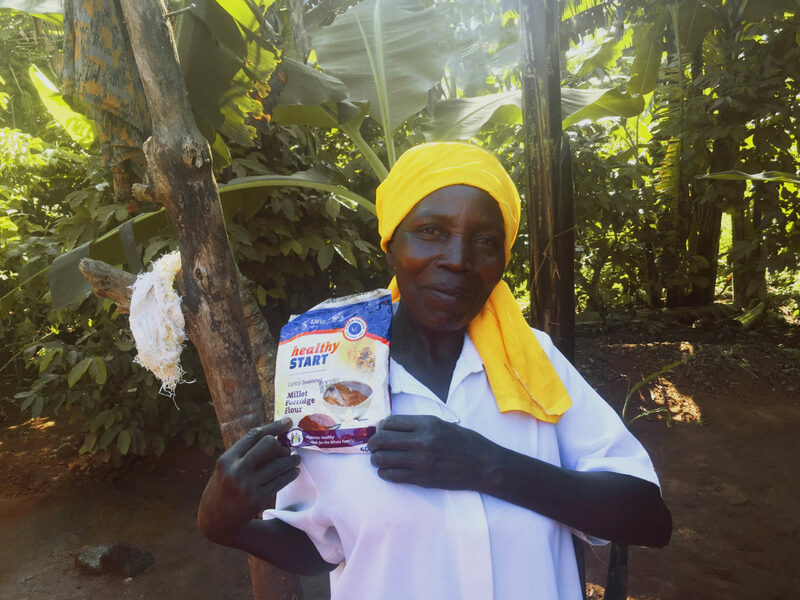 Tibiwa Alaisa and a growing number of African women entrepreneurs are making an incredible impact in the rural area of Mayuge, Uganda, selling goods and growing businesses every single day. Tibiwa is an inspiration, and it all started with water and sanitation. Learn about how water and sanitation alleviate global poverty. When we met with Tibiwa in her home, she was preparing cassava for dinner. Her youngest, a boy of four they call Hajji, was staring impatiently at his mother, and Tibiwa smiled, resisting a laugh. “He’s hungry,” she announced. Tibiwa put her son’s cassava in a bowl and handed it to him. She looked toward us, “Should I start from the beginning?” she asked. Tibiwa proudly showcases the millet flour that she sells. Growing up in 1970s, Tibiwa Alaisa’s early life was marked by the rule of Idi Amin, dictator of Uganda, and later, the terror of the Lord’s Resistance Army (LRA) known for abducting tens of thousands of children. In the eight years of his reign, Amin and his teams would murder an estimated 300,000 people— people chosen for their money, land, women, or simply so that he could make an example of his brutality. Tibiwa’s mother, father, and eleven siblings survived the horrifying time, but they were still faced with an ever-present issue; the family was sick, constantly, from waterborne illness, and Tibiwa recalls seeing it as normal. And when she got married and gave birth to her three children, they too were afflicted with waterborne sicknesses like typhoid and dysentery, often missing school. Tibiwa and husband Twaha weren’t equipped with sanitary knowledge that could prevent the spread of germs. And, like many rural parents in Uganda, they regularly used their agricultural profits for clinic fees and the purchase of bottled water. But that’s behind them, forever. “Today, my children live healthy lives,” she said. And today, Tibiwa is a catalyst of community advancement in the Namalere village of Mayuge, Uganda. Ugandan women lead the way for social progress. We worked with local leaders to install a well and trained the community to practice healthy habits to keep their water clean. Tibiwa’s family stopped getting sick as often and no longer had to purchase the expensive, store-bought water. They could finally save money, and she started selling millet flour to her community. She opened up a savings account and bought a plot of land. She’s now making plans for the opening of a commercial building in 2019, one that she will use to sell her flour and rent shops to other businesses. Catherine Apio, Program Manager for Lifewater’s work in Mayuge, knows Tibiwa personally. Tibiwa began to inspire her friends, showing them around her newly purchased land, sharing her own dreams, and teaching them how to start businesses. “Tibiwa wants women to be empowered, and she also wants to support other women to eradicate poverty and help women reduce dependency on men for all domestic needs,” she said. Now, Nangobi Jamawa trades in groceries. Kantono Faridah sells hats to the village residents. Another friend owns a salon and another deals in sweaters, scarves, and socks for babies. “The money [my husband and I] spent on water and treatments is what I saved to start the millet distribution business… this business has made it easier to educate my children. Thank you,” Tibiwa said. 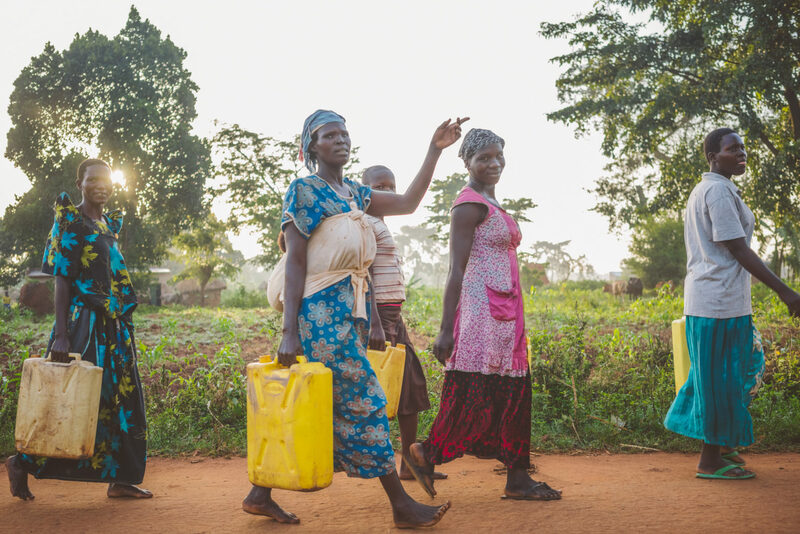 Community development starts with a village coming together to make their community healthier, and a village that makes small health improvements on their own and gains access to safe water is a village that can begin to step out of poverty. Safe water lays the foundation for social development, and Tibiwa and her friends are wasting no time getting their families out of poverty. Together, these women are ensuring that the future for Mayuge is bright.